References - Whiteley, J. "Was William Wise a Plagiarist", in Glazed Expressions, summer 1981, p. 1.; Lockett, T. Collecting Victorian Tiles, 1979, pp. 106-7. 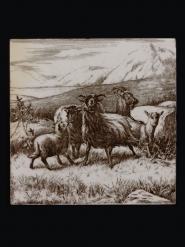 A dust-pressed earthenware tile, transfer-printed underglaze in black with a design of highland cattle in mountainous country. The design is from one of two series of tiles: Animals of the Farm or Cattle Subjects. William Wise took the designs from Robert Hills' Etchings of Animals Drawn from Nature (1798-1815). Wise was one of a number of designers and illustrators who turned their hand to the design of tile decoration for Mintons China Works in the late-19th century.